Music is the soundtrack to my memories. I listen so I don't forget. I have shelf of tapes on which I catalogue my experiences, thoughts, and feelings. Each tape represents an important part of my life. I pull González & Steenkiste's "Through the Mountain" from the shelf when I want to reflect on a day I spent in Vienna a few months ago. I received the tape in a trade with the Viennese label, Feathered Coyote Records, and was surprised to learn after a few listens that González & Steenkiste are based in Belgium; surprised because of how well the tape compliments my memories of the experience. I hear Vienna in the tape. I feel Vienna in the tape. And I close my eyes and see Vienna. The Foot & The Belly. On the train from the airport to downtown. Exhausted from days of being sick and nights without sleep. 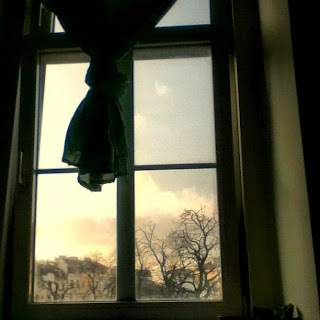 In a daze--almost dozing off while staring out the window at the Austrian plains--I found comfort in the subtle geography. A light layer of fog collected near the ground, separating the green fields from the blue sky. I hadn't seen the sun for as many days as I was sick, and I welcomed its warmth. The Chest. The beautiful city: an enigmatic organism, whose mystery grew each minute. I could feel the pulse of the city's rich cultural history, but from which direction I could not tell. Still there was something else there--something everyone was aware of, but not talking about. I can't describe it, but I felt it. I felt secrets, sadness, and repressed emotions. I listen hoping one day I'll understand. The Eye. I was sitting in chair looking out the window of my hosts' flat. The window slightly open to welcome some fresh air, but not so much to disturb the warmth of the room. The sun shining on my legs, we all sat listening to a record without talking. Viennese windows will forever remain a symbol of peace.